(BROWNSBURG, IN – July 13) Robert Stout was on his game for his busiest weekend of the year June 21-23. Stout scored two podium finishes competing in three races in two separate series – the Global Mazda MX-5 Cup series from Road America, Elkhart Lake, WI and the Lucas Oil Off Road Racing series from Lucas Oil Speedway in Wheatland, MO. The reigning Mazda MX-5 Cup Rookie of the Year kicked off the weekend with a double round of Mazda MX-5 Cup series qualifying on the legendary four-mile Road America road course. Missing the mark just a bit he qualified his Lucas Oil / SC Fuels / Magic-Dry Absorbent / Impact No. 28 Mazda MX-5 prepared by McCumbee McAleer Racing 8th in the 25-car field for Round 5 of the 2018 season but stepped it up for Round 6 earning a starting spot in 4th. The Round 5 race proved to be quite a challenge as Stout battled for 45 minutes in the lead pack of 10 only to advance one spot finishing 7th as the checkered flag flew. Stout had a much better opportunity to podium for Round 6 given he was starting on the outside of row 2, but at the drop of the green flag the inside row sailed right by pushing him back into 8th at the end of lap one – a huge hole to dig out of. With 40 minutes to work he started picking his way to the front and with 10 minutes to go had made his way back up to 2nd behind teammate Joey Bickers in the No. 34 McCumbee MacAleer Racing machine. The MMR tandem didn’t stay there long though as the pack drafted by just one lap later. Stout fell back to 4th in a four-car breakaway and was ready to battle for the front, but a yellow flag came out with just five minutes to go grouping the 25-car pack back together, setting the stage for a final lap fight! The restart saw the green and white flags fly simultaneously and the battle was on. Stout was able to get around Bickers in the hard-braking zone of turn 5 and hung on to finish 3rd for his 2nd podium of the season! Leaving Road America, Stout was just eight points out of 2nd place in the Mazda MX-5 Cup Driver’s Championship. Stout then climbed into the truck and headed 10 hours south to beautiful Lucas Oil Speedway in Wheatland, MO to compete in the Off Road series in the Production 1000 UTV class. 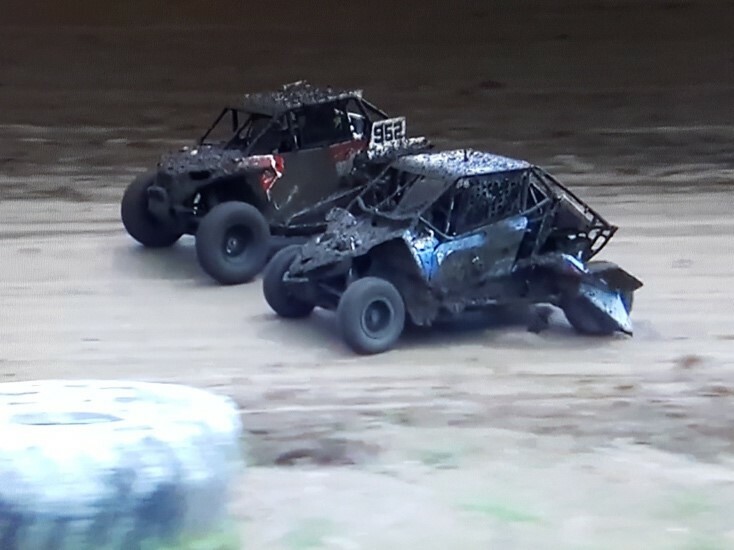 It would be doubly difficult for the Lucas Oil Off Road Racing series rookie at Wheatland as the series had already been racing there for two days and Stout would have to play catch-up. The KSR team acquired Brandon Arthur to fill in for Stout for Round 4 while he competed at Road America. Arthur got off to a great start as he qualified the No. 915 Magic-Dry Absorbent / Yawpower / SC Fuels / Impact / Cover Craft Yamaha up front earning the KSR team their first pole in the series! Arthur and series champion Brock Heger battled back and forth for the lead in the first few laps of Round 4. While Arthur was leading Heger he clipped the inside berm and rolled the car over on its lid. While the track safety crew were able to roll the car back over for Arthur to continue the damage to the front end was severe. The run for the win was over and the day ended with a 12th place finish. With Stout back behind the wheel for Round 5 at the challenging 1.2-mile course, the series allowed two hardship laps to ensure repairs to the damaged front-end were good. Stout made one lap at 70% then attacked with full confidence clearing the huge 200-foot table top on lap 2. Next up was qualifying but racing in the Midwest always has its challenges and Mother Nature decided to play a roll. Light rain began to fall just before the class headed out for the quick five-lap session creating a slick muddy challenge. Stout was able to record an early lap that had him in the top 5 but the course quickly dried up and the Hoosier tires were coming to life as Stout was learning the track. On his final qualifying lap he put one together and jumped up to 2nd just 8-tenths off the pole held by the reigning champ Brock Heger in the No. 921 machine. Mother nature then unloaded her furry with a torrential downpour turning the course into a muddy swamp forcing a delay. Stout’s goal once the race got underway was to stay out front and keep the face mask clean but it wasn’t going to be that easy. Stout led the field to the green flag but at the hit of the throttle blasted into some thick heavy mud allowing Heger to grab the hole shot into turn one as the entire field dealt with the extremely slippery track. Stout slotted into second but a hard charging Keith Brooks in the No. 942 machine got by on lap 2 and by the midway point of the shortened race Stout was back to 4th as Ronnie Anderson in the No. 952 machine was also able to get by. During the series’ mandatory caution Stout radioed in that the face mask was fogging up and he had used all of his tear-offs. In short, he just couldn’t see where he was going. With a chance to clear his shield the second half of the race began. With heavy mud weighing down part of his car’s left rear body panel, Stout was still able to keep pace with the 2nd and 3rd place competitors Brooks and Anderson. Brooks made a mistake that allowed both Anderson and Stout to get by then on the final lap Anderson went wide in turn 3 allowing Stout to pull up beside him as the two went side by side over the 200’ table top. They dove into turn 4 beside each other when Anderson caught a rut and shot off the track up near the wall and Stout was back up to 2nd. Brooks gathered himself up and was about three-car lengths behind Stout in 3rd as they entered the tough rhythm section before turn 6. Brooks with no chance at a clean pass made a bonsai move with the full intention of using Stout as a turning post and did just that. Brooks ran an early apex line and then slid up into Stout. The hit was so severe it launched Stout up 35 degrees on to the outside tires and the AIM data device recorded a 4G hit. Stout managed to hang on to it without flipping and finished the final lap crossing the stripe in 3rd. Stout, standing in front of his mud riddled Yamaha as he claimed his 3rd place honors, proudly thanked all his sponsors while the camera rolled for CBSSN & MAVTV. The team of asphalt aces are making great progress at a quick pace. Through the first five rounds, the KSR team has a 12th, 7th, 4th, 12th and 3rd including a pole and a 2nd-place qualifying effort at Wheatland. Special thanks to all that support the KSR team including Magic-Dry Absorbent / Yawpower Suspension / Lucas Oil Products / SC Fuels / Impact Race Products / Yamaha / Cover Craft / P.C.I. Radios / Sal Ramos Apparel. The KSR team also welcomes back Cover Craft as a product sponsor to the team. March 3-4 (TEST) Barber Motorsports Park, Birmingham, Ala.